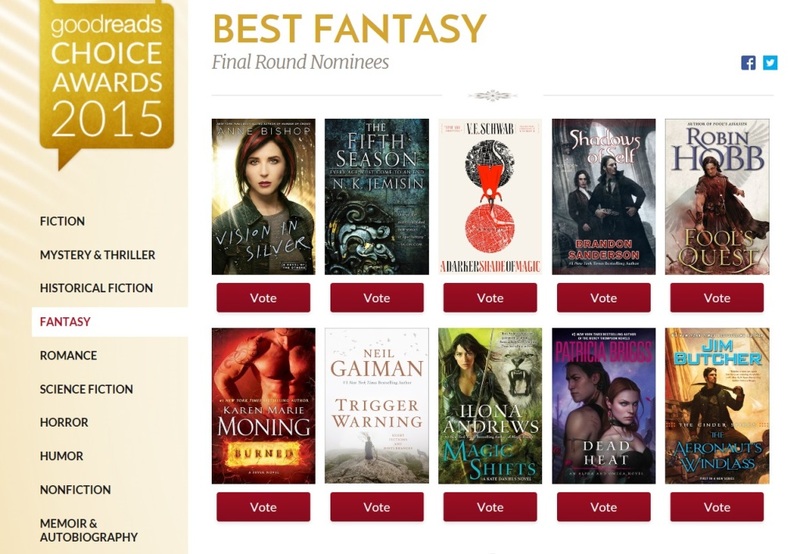 Use these links to check out the Final Round Nominees in the Goodreads Choice 2015 Science Fiction, Fantasy, YA SF and Fantasy, Graphic Novels and Comic, and Horror categories. This entry was posted in Awards and tagged Goodreads Choice Awards by Mike Glyer. Bookmark the permalink. Lotta SJW literati books on those lists. I’m just sayin’. I dusted off my seldom-used Goodreads account to vote in a few categories. Jim Henley: Lotta SJW literati books on those lists. I’m just sayin’. @JJ: I’m starting to think some of these books are…genuinely popular. Heh. I’ve yet to read it, but it’s amusing to see Aftermath there, given the various blatherations about how it was a terribly written book, and the author was spitting on his fans, and blah. Well, it looks like the fans on one of the biggest fan-participated (or is it the biggest?) disagree. Severely. Oh, and hey? Tie-in fiction right there. Anyway, what’s the local opinion on Golden Sun, The Fold, and The Water Knife? I ask because I clearly don’t have enough to read. I have The Water Knife. It’s a near-future sci-fi thriller about climate change that’s frighteningly plausible, at least as far as I’m concerned, as it’s set in Phoenix and I live in Arizona. I would rate it four stars, good but not quite up to the level of other books I have on my list. YMMV. Is that the USA cover for Seveneves? I think I like the UK one better. Ancillary Mercy is still one of the primary highlighted books in the iBooks sci-fi and fantasy section, by the way (Aftermath is also highlighted, but further down – so is Three Body Problem with a nice obvious “Hugo Award Winner” banner on it). The SJWs truly are everywhere. What’s more, Aftermath got there via the write-in process. No way to do that without a whole lot o’ fans. But how can this be when regular folks don’t buy that rubbish? This inspired me to have a look and see what science fiction books are selling well in Turkey at the moment, according to the main bookshop chain here. 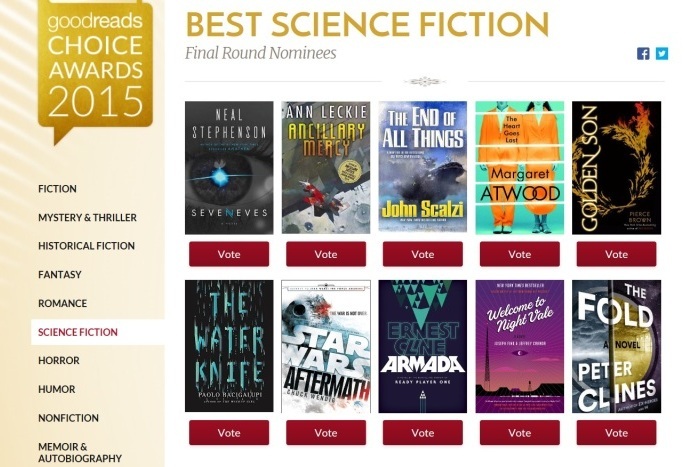 Ancillary Justice is in the top 10 SFF books, somehow. So is The Dispossessed, the 40 year old book that only academics like. Anyway, what’s the local opinion on Golden Sun, The Fold, and The Water Knife? I haven’t read any of them, but I have read Red Rising, which is the book that comes before Golden Son in Brown’s series. It was pretty good dystopian science fiction – good enough that I’ll be getting Golden Son in the relatively near future to read it as well. OMGerd! Scalzi made it? The Cabal is everywhere. And now there is a song by The Doubleclicks explaining how Scalzi is not a very popular author and is a terrible person. …and apparently I’ve been pronouncing “Scalzi” wrong for several years. But that’s okay, because according to that song I shouldn’t care about the guy anyway! Thanks for the song link, Aaron. This year I voted in less categories than ever before. I’ve been reading too much SFF and not enough other stuff. Many years I’m able to vote in 80% of the categories. This year I voted in 5. I did write-ins for several categories which was a first. In the end I was surprised by some of my final votes. Of course I’ve got more added to my TBR list. It says here, “Goodreads Choice Awards, the only major book awards decided by readers.” I have read that over a few times, and decided it means the Hugo Award is not considered a major book award. Am I the only one who would argue that point? I assumed they were defining ‘readers’ in a way that somehow excluded the members of the WSFS from counting as “just” readers. After all, one assumes all book awards of any note, including the juried ones, are decided by people who read the candidates and would count under a broad category of ‘readers’. No but I wouldn’t take it that seriously. 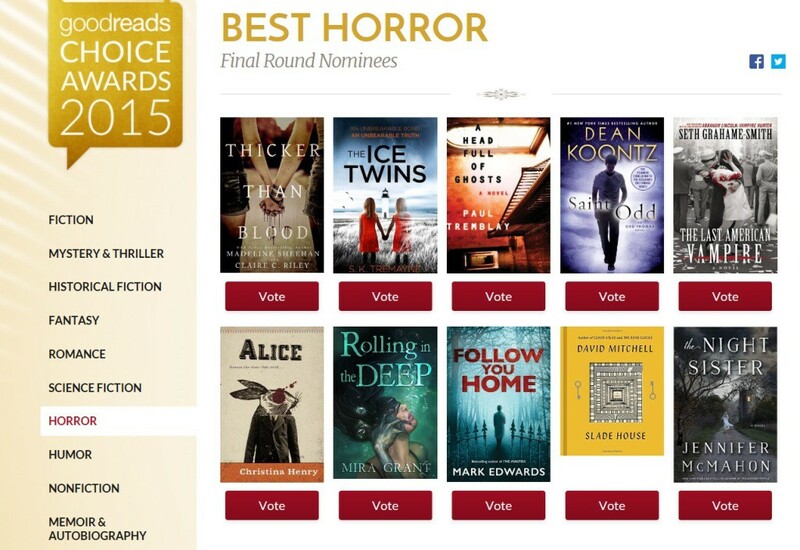 There are not many readers voting in the Hugos and the Hugos have a voting fee. So really, what other awards can be voted on by readers that are just readers and not voting because of a paid membership. I don’t think Scalzi has a prayer of winning the award this year. It is Book 6 in a series. But last year he placed second behind “The Martian”. Using puppy logic, that means since “The Martian” was not eligible the next popular rocking good action SF should win the Hugo and that was “Lock In”. Zenu: There are not many readers voting in the Hugos and the Hugos have a voting fee. No, the Hugo Awards do not have a voting fee. Gods, I am so tired of the claims that there is a “fee” or a “poll tax” to vote in the Hugos (never mind the fact that “poll tax” refers only to having to pay a fee to exercise a civil right, and the Hugos are most decidedly not a “civil right”). The Hugo Awards are determined by members of the WSFS. The members of the WSFS are whoever has a membership to Worldcon that year (though the WSFS Business Meeting very nicely decided to give nomination rights to the members of the Worldcons the year before and the year after the current year). There is no “fee” to nominate or vote on the Hugos. Nomination and voting rights on the Hugos are a privilege — just one of the privileges — of being a member of the WSFS.